Our active urban lives must not make us give up on our values, and our consumer habits must reflect all of this without us giving up on pleasure. 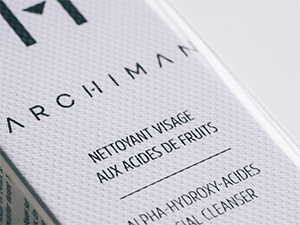 1 — Minimum of 95% natural ingredients for each product. 2 — The remaining 5% are the ones that give texture and stability, or preservatives, with no risk to health or the environment and which do not compromise the effectiveness or safety of the products. 3 — Not tested on animals: but only on our friends! 4 — Total respect for the #Archiblacklist of controversial ingredients which will never be used by Archiman. 5 — 100% natural perfume. 6 — Tested in dermatological conditions and under the control of independent toxicology experts. 7 — Always prioritising sustainability. 8 — Made in France.